what kind of pig are you? Here is the timeline through which I have experienced the pig story. Two weeks ago, several hundred dead pigs were found floating in the Jiaxing River, a tributary of Shanghai’s Huangpu River. Last week, an American friend uploaded this photo Pigs Swimming in Mud Cake to Facebook. I don’t know if this is true or false, but it must be forwarded: eat less pork! Shanghai has claimed that over 8,000 pigs froze to death! In the middle of a bright South China Spring! I’m begging the relevant ministries – can’t you exert your brains and come up with a more believable reason? Don’t treat the people as if we were three year olds. One dead pig is a random occurrence. Two dead pigs is a random occurrence. But over 8,000 pigs dead is random? There must be a reason! Today, the truth has finally been revealed! – Where is the future of the Chinese People? We’re digging our own graves and anhilating our people! [Forwarded message: according to a pig farmer, there’s a chemical called 机砷. In ordinary language that’s 砒霜 or arsenic! This chemical is used in pig feed like “四月肥” [literally “Fat in April”- MA] that accelerate the maturation of pig and make their skin shiny, increasing profits from selling pigs. The downside to the process is that the arsenic accumulates in the pigs’ bodies, which have no way of breaking down the poison. The poison causes the pigs’ internal organs to rot, and after four or five months eating this pig feed, most pigs die. Consequently, farmers only use this pig feed three or four months before bringing their pigs to market. As long as the pigs are slaughtered immediately, there’s no problem. But this Chinese New Year’s season, it was mandated that there could be no more government feasting and banqueting. Suddenly, the bottom dropped out of the pork market. Pig farmers were forced to continue raising pigs that had already been eating contaminated pig feed for four months. A month or two later, a massive die-off of the pigs that had been prepared to sell during the New Year’s season started. This story couldn’t be revealed. However, no one dared to bring already dead pig meat to market [instead of living pigs that would be slaughtered onsite to guarantee freshness – MA]. Consequently, the pig carcasses were tossed into tributaries of the Huangpu River. Clearly, the problem was caused because on the one hand, too many pig farmers are using pig feed to accelerate maturation and on the other hand, the banquet ban was too effective. The floating carcasses were discovered by the media. So maybe a thousand, maybe more pig carcasses are drifting silently in the Huangpu River. This is the horrific story that they are telling. The state-controlled Southern Weekly newspaper, citing court documents, said three men were sentenced to life in prison in Jiaxing last November for procuring dead pigs to sell their meat. It says the men and their group bought 77,000 dead pigs in a period of more than two years. So, reflective moment du jour: Who are you? 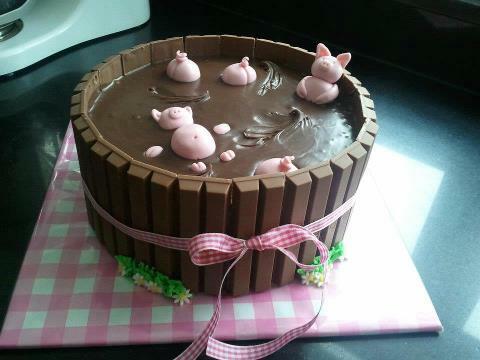 A pig happily swimming in a mud cake, anticipating sugar highs? Or a pig drifiting in dark waters, fearful about what the Chinese government might be hiding and how this silence kills? Of course, it’s all evidence that China and the US are the same country. After all, processed white sugar may also be toxic. This entry was posted in noted and tagged china, food, huangpu river pigs, media, social media, text message, translation, weixin. Bookmark the permalink. Hi Mary Ann: Just read you’re interesting (shocking actually) March post on July 11th. I found it thanks to the Pigs ‘Mudcake’ picture from Google images search, which I found hilarious! After reading your blog – wow, that disappeared. I’m a Canadian who visits China to see my gf. Last time I was by the Huangpu was about a year before those poor pigs. Good thing we didn’t see Huangpu pigs back then I suppose. Thank you for the education here – I’ll advise accordingly. Take Care.